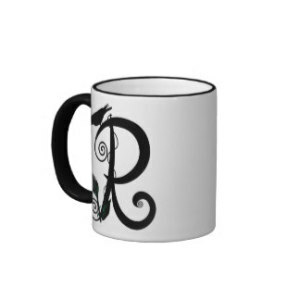 ‘Gothic Initial R’ Ringer Coffee Mug. Add a pop of colour to your mug design with the Ringer Mug. Handle and lip of the mug are coloured to match. Available in 325 ml or 473 ml (11 oz or 15 oz). Choose from 10 colours. Dishwasher and microwave safe. Imported.